Includes 3 World Heritage Sites and the world's best ophiolite. Includes: Bed and Breakfast accommodation, transportation, geological guiding and all castle and geosite entrance fees. Prices are per person, based on 2 people sharing a room. Single supplement of £275 applies. 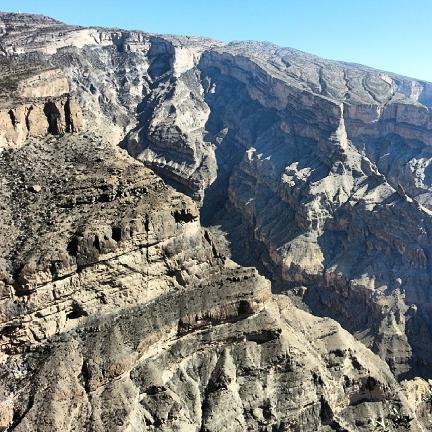 The geology of Oman is spectacular. Exceptionally well exposed rocks offer a fascinating outcrop experience, second to none. The scenery is unique and often breathtaking. The Samail Ophiolite (former sea floor you can walk on), mountain ranges of more than 3000 m altitude, and deeply incised canyons with turquoise-coloured perennial streams, contrast with dry but golden sand deserts. And the coastal areas have kilometres of white beaches. The country is also blessed with great archaeology and several world heritage sites. 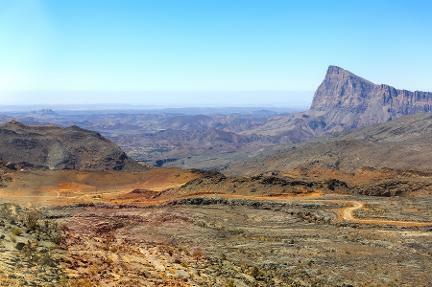 Views of Jebel Shams, the highest mountain in Oman. The 'Mother of All Outcrops' folds in radiolarian cherts. Day 1 - Arrive in Muscat, Oman. We will stay at a hotel near to the International Airport. 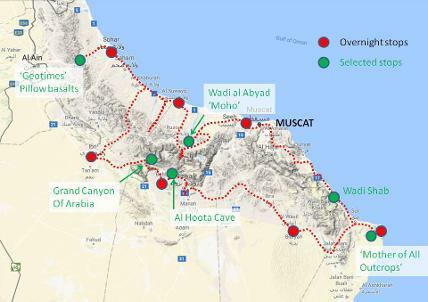 Day 2 - Our first stop today is one of Oman's greatest geosites. We travel to Wadi al Abyad to see the world's best outcrops of the Moho. The Moho is another name for the Mohorovičić discontinuity and is the boundary between the Earth's crust and mantle. To reach Wadi al Abyad we must drive off-road on a river bed, and the wadi is about an hour an half from Muscat. We spend the whole morning in the Wadi al Abyad and seeing not only the Moho, but layered gabbro, and for those of you who can walk a little further, wherlite outcrops and calcite precipitations that give the wadi its name which means the 'White Wadi'. Our first short stop in the afternoon is Wadi Mistal where we can see Cretaceous rudists fossils, a type of bivavle. When then move on to a site named Wadi Bani Kharus, where we view an impressive angular unconformity between Late Precambrian and Early Permian sedimentary rocks. The Precambrian rocks are of great interest because they contain fossil stromatolites. We then journey on a few more kilometres to a site called Wadi Haslan. Here we observe 'Snowball Earth' deposits. These are glacial deposits that were lain down 711.8 million years ago when it is thought the whole planet was covered by ice-sheet and sea ice. From here we drive to Al Mudayq on the coast where we spend the night. Total drive time: 3 to 4 hrs. Day 4 - The first stop of our day is the world renowned Wadi al Jizzi pillow basalts, also known as the 'Geotimes' outcrop after a photograph of them appeared on the front cover of Geotimes magazine in 1972. We then travel to a fossilised White smoker near to a place called Al Ghizayn. At Al Ghizayn we can see yet more pillow basalts and the remains of an ancient copper mine. We then move on to a site were we can see over-thrust folds and faults and the metamorphic sole of the ophiolite. From here we travel on an unsurfaced road to a site with mullions and boudinage and from there to a road cutting with very colourful sediments in a place called Wadi al Kabir. We spend the night in the town of Ibri. Total drive time: 3 hrs 20 mins. Day 5 - Our first stop is Al Ayn UNESCO World Heritage Site. Here there are 21 Bronze Age tombs set in impressive scenery. From here we move a short distance down the road to take in views of the Jebel Misht viewpoint a mountain made up of limestone and dolomite. From there we move on another short distance to stop at a chevron fold at Al Hayl. We then drive to a site with great fossils called Megalodonts. These were giant bivalves that lived in the Triassic and grew up to 20 cm across. Then we continue on to reach the "Grand Canyon of Arabia". This is a spectacular gorge with cliffs more than 1,000m high, that cuts through the entire Cretaceous and Jurassic carbonate sequences. 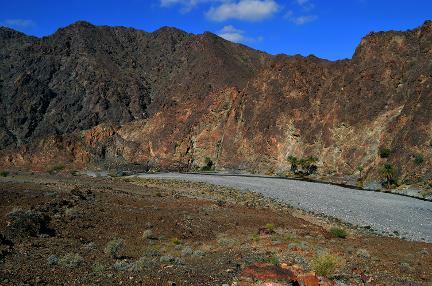 The gorge also sits under Jebel Shams, the highest mountain in Oman. The next site is Wadi Ghul where fossil rudists can be seen in Cretaceous limestones. We then stop at an archaeological site called Coleman's rock which consists of Neolithic rock carvings. Our final stop of the day is the town of Bahla where we spend the night. Bahla's Fort is a World Heritage Site; we will either visit it that evening or first thing next morning depending on time. Day 6 - Our first stop of the day is the Al Hoota Cave. This 2 million year old cave is the first and only showcave in the Arabian Peninsula. It has a rich ecosystem that includes 4 lakes and we spend most of the morning on an underground tour. We then proceed to Falaj Daris World Heritage Site, which is a 2000 year old irrigation system. We then drive on for about an hour to reach a site where there are impressive views of the Moho on a distant mountain. The night is spent in the Wahiba Sands area where huge sand dunes of up to 70m high can be seen. Accommodation is a choice of a tented desert camp or a normal hotel in the nearby town of Bidiyah. Day 7. From Bidiyah we drive to the town of Sur on the coast. Here we stop to view the mangrove forests. 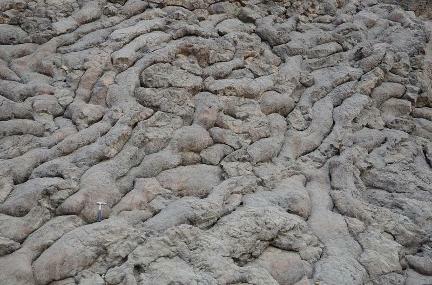 Our next stop on the outskirts of Sur is a stop where we can see an amethyst vein in carbonate rocks. We then drive on to a famous geosite called the 'Mother of All Outcrops'. Here we see beautiful folds in radiolarian cherts. We spend quite a lot of time here as there are 7 different outcrops to see. 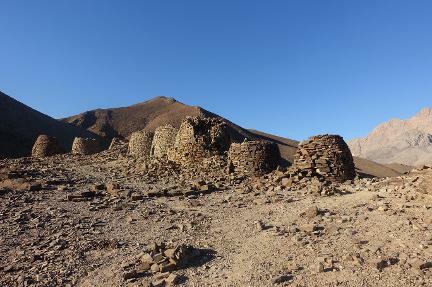 We then move on to Ras al Hadd where we first visit an early Bronze Age settlement before stopping for the night. Ras al Hadd is also famous for its turtle beaches and there will be the optional extra chance of joining a turtle viewing tour. Drive time: 3 hrs. Day 8. 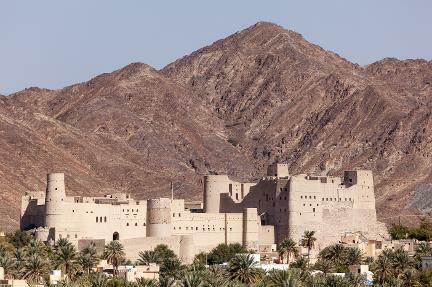 Today is our last touring day and we head back to Muscat along the coast but there is much to see along our way. Our first stop is the site of a fossil coral reef. 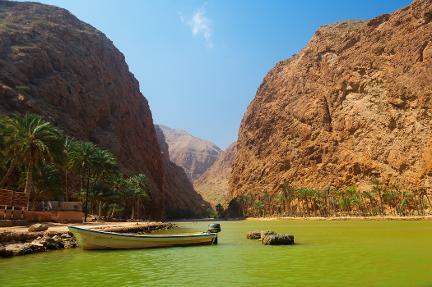 This is followed by the famous Wadi Shab, considered by many to be the most beautiful Wadi in Oman. Here there are beautiful doline pools that we can swim in. The next stop is a coastal site where huge boulders carried by tsunamis have be hurled up onto the shore. We then proceed to the Bimmah Sinkhole formed from a collapsed cave. 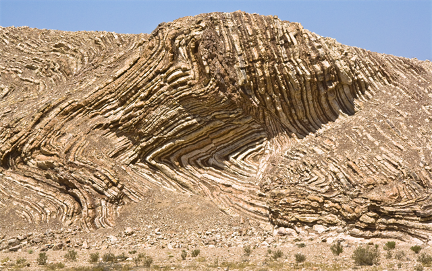 Our final stop is the Wadi al Mayh mega sheath fold. This sheath fold is one of the largest and best exposed in the world. We then drive through the capital city, Muscat, to reach our hotel near the airport. Driving time: 2 hrs. Day 9. Today we depart, but it is recommend that you stay on an extra day or two if you want to explore the city of Muscat at your leisure.